A new steps challenge is set to take a bite out of hunger in local communities. With each and every step, participants in the Go365 National Step Tournament 2018 can do their part to end food insecurity. One million meals, divided across winning teams, will be donated to Feeding America, the nation’s largest domestic hunger-relief organization, in the name of the winning teams’ respective companies. The Go365 National Step Tournament is a step challenge in which all commercial groups of two or more eligible Go365 members can compete against each other for the highest team average step count. Participants can do some good for their communities through the donation to Feeding America while also earning all-important bragging rights. Companies compete against other similarly sized groups (or divisions) through a series of three individual challenge rounds counting the highest average step count per day. Round 1 will consist of divisional winners from four regions: East, West, Midwest and South. Joining is easy! Follow this step-by-step guide to learn how to be part of your company’s team. Check out this FAQ for additional information. 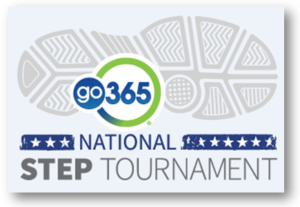 Many Indiana state employees have already signed-up to be part of the Go365 National Step Tournament! Join the team today and do your part to fight food insecurity! What can I do If I cant walk because of Surgery?